Women Artists and Writers: Compassion, Creativity, and Courage is a fundraising exhibit sponsored by The Compassion Anthology and supported by the Beverly Arts District to benefit Amirah, a refuge for women who want to break free from exploitation. The exhibit is on display at Porter Mill Art Gallery in Beverly, MA for the month of August; forty percent of all sales go directly to Amirah. Most of the work in the exhibit is shown below. If you would like to purchase a piece, please email Laurette Folk at compassionanthology@gmail.com. The paintings “Grace” and “Bearing” are two of a four part series titled “Wise Women,” created for my last solo exhibition “Beautiful Burden.” These female archetypes are created of a new mythology; they offer wisdom in the realm of transformation and healing. “Bearing” offers the wisdom of transmutation—she has transformed her pain and is bearing the fruits of her labor. “Grace,” represented as an angelic being cradling a baby, offers the wisdom of compassion through tenderness and faith. Claudette Dean is a published artist with four solo exhibitions and an award for ‘Excellence in Fine Arts” from the Commonwealth of the Bahamas where her work has been acquired for the National Collection. She was born and schooled in Canada and has been living and working in the Bahamas since 1979. Intrinsic to her art is Claudette’s spiritual view of the world. I have been creating a series of animal portraits in the hopes that I would inspire empathy and compassion in the hearts and minds of the viewers of my work. In our modern era, animal habitats are consistently threatened by encroaching human development. Factory farms have taken over the food industry and a variety of species are becoming endangered and extinct due to environmental pollution and illegal poaching. It is my artwork’s aim to call attention to the dire need for humans to have compassion for animals. In many ancient cultures animals were considered to possess symbolic powers and were venerated, respected, and worshipped. I believe that humans and animals possess souls and my artwork calls upon the viewer to witness the soul of the animal I have depicted. In this visual process, it is my goal to not only create empathy but to deepen the viewer’s humanity. Sara Gately is a Boston-based 2D Visual Artist and K-8 Visual Arts Educator. Sara attended Lesley University for her Masters in Education and she currently teaches at a private Catholic school in West Roxbury. She has actively been displaying art in the Metropolitan area for five years. My work is inspired by women, science, and nature. One of the underlying themes is the battle against depression, anxiety, and consuming thoughts. Most of the pieces consist of varying layers of painting, drawing, found objects, items from nature, and recycled materials. Recently I have made an effort to allow my work to be more fluid and evolve rather than plan the outcome. I am always exploring new techniques and try to go against the norm. My work is meant to evoke strong emotions as well as encourage viewers to take a closer look. The most influential artist to me is Frida Kahlo and I hope to draw more inspiration from her work and life. Tara White is a mixed media artist who has been living and working on the North Shore since 1982. She was introduced to art as a child and was greatly influenced by her high school art teacher. She has her Bachelors of Science in Biology, with minors in Fine Art and Chemistry. This drawing speaks to courage and the indomitable strength of the spirit to overcome obstacles and setbacks in life. We have within each of us the capacity to transcend and learn from those painful times that are woven into the process of living. Nancy Wells is a visual artist and a poet. She lives in Damascus, Pennsylvania close to the Delaware River. She has exhibited her artwork widely in the United States and abroad. Spacial relationships and composition are the filters that I look through at everything around me. They inform my work and my appreciation of the art I see in nature. My artistic expression is one of a flattened perspective, highlighting colorful spacial relationships. Lately I have been using prints of my watercolors and photographs to express myself in a new and exciting way bringing parts of different images together in collage. Constance Festo Lafond is an artist who works in several media including watercolor, acrylic, photography and collage. Color and composition play an important role in her creative expression, which focuses on the incredible beauty in the physical and natural forms in life. Connie is currently represented by the Zephyr Art Gallery in Salem, MA; she is a member of the Arts Collaborative of Wakefield as well as the Medford Arts Center. She is currently living in Wakefield, MA with a studio at Porter Mill in Beverly. 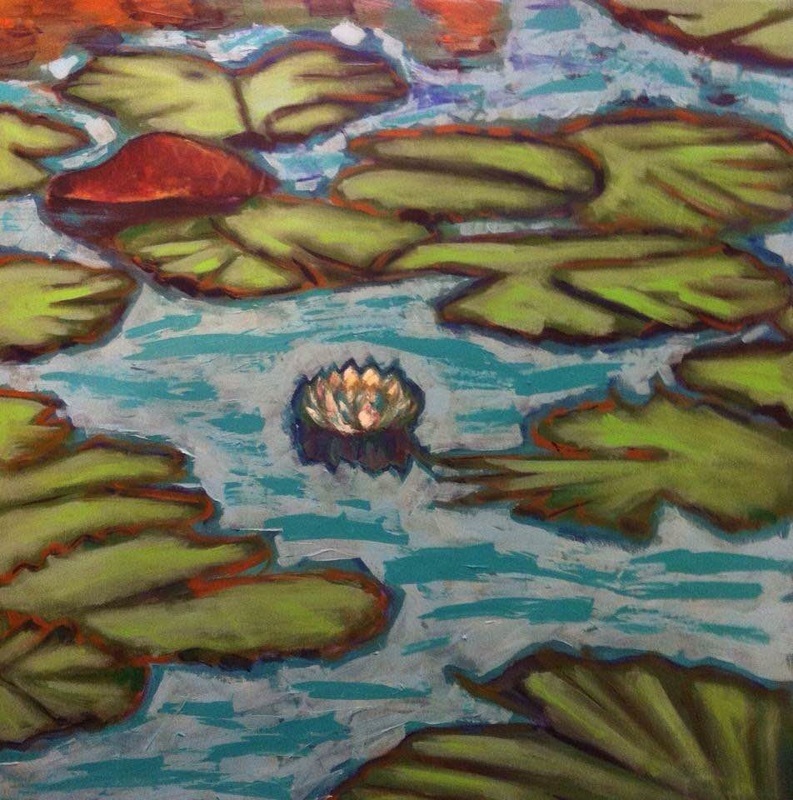 "Lotus Light" depicts a lotus flower, while "Immortal Bloom" depicts a lily flower. Both of these flowers are associated with rebirth and immortality—the lotus is well known in Buddhist philosophy, while lily flowers had medicinal and mystical use in ancient Mayan and Egyptian cultures. Buddhist philosophy reflects a deep reverence for all of life and views specifically human life as having the essence of a beautiful, brilliant, and indestructible diamond. The flowers blooming magnificently through the mud provide an analogy of this belief, of the hope, light and beauty that can persevere through suffering. This reflects not only a deep compassion for all of life, but oneself as well. The idea of multiple realities within nonlinear time is the focus of my new work. Informed by Byzantine and Northern Renaissance painting, a recent art residency in Italy, Dante's Divine Comedy and the Hindu epic The Ramayana, among others, my otherworldly environments are usually inhabited by a lone female figure in vast nature, sometimes in a chaotic world. 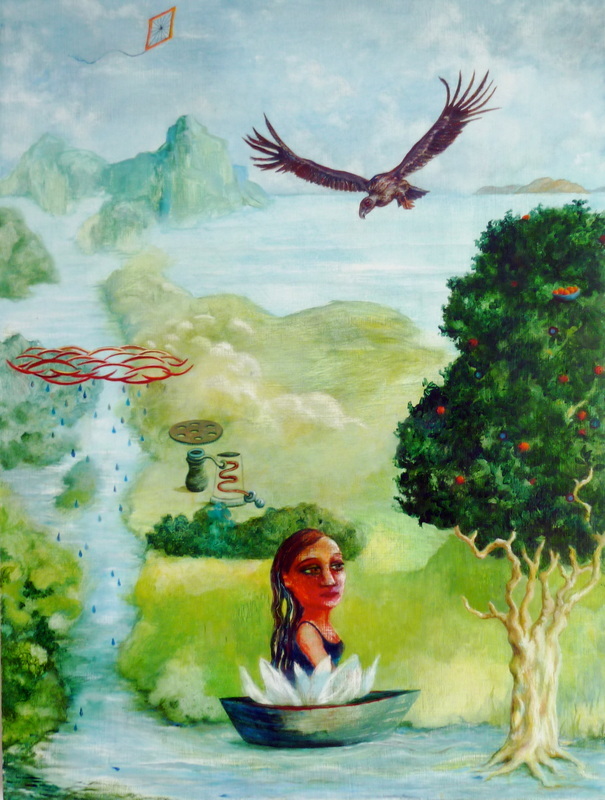 Combining fragmented “puzzle pieces” from various cultures, archetypes, and the natural world, I'm able to explore the concept, from both Western physics and Eastern philosophy, that all phenomena is interdependent and interconnected. With "Disentangled," the woman in the painting embarks on a journey in a small boat, where she is emerging from and surrounded by a lotus flower. In Buddhism, the lotus symbolizes enlightenment: the beautiful, delicate flower blooms with all its glory in a muddy swamp. Perseverance, compassion, and overcoming obstacles are part of the message. Jill Slaymaker’s work is in the permanent collections of The Whitney Museum of American Art, NY; The Museum of Modern Art, NY; and the Davis Mini-Museum of Contemporary Art, Barcelona, as well as many other international public and private collections. Jill received her MFA in painting from Texas A & M and lives in Manhattan. As an artist and an adoptee, much of my work has been a reflection of my search for my first mother’s face. In my depictions of floating figures and faceless apparitions, I have struggled to form an identity and a likeness for her. I look into my own face and features and can only partially reconstruct what she may look like. These four pieces reflect my ongoing emotional and creative quest for my first mother and for my own identity as an adoptee, an artist, and a mother myself. It takes courage in the form of emotional vulnerability to continue my journey. The creative process has been my constant companion during the literal and metaphorical search for my origins. The ongoing experience of being an adoptee has required self-compassion and compassion for my first mother. Sara Roizen is an artist and licensed board-certified creative arts therapist. She received her BFA in Painting from the Rhode Island School of Design and a Masters in Art Therapy from Pratt Institute. Her blog, Art Therapy Spot, has well over 10,000 likes on Facebook. Throughout the years, she has continuously maintained her personal art making practice. For her, art making is a way of life and imbues her days with a sense of purpose and joy. As an artist and art therapist, she uses art making as a path of expression and healing for herself and her clients. I try to be honest in my work by listening to myself in regard to subject matter and color choices. I think honesty takes courage and supports connection through creativity. Honesty and connection are important elements of compassion, so hopefully at times my work can touch on and spark compassion as well. My collage work mostly accompanies my writing in the many journals I have stored away in my house. I have given much of it away as gifts, as well. Collage is a way for me to delight in color and form while honing in on a certain emotion or topic. This particular piece emerged while I was working with my kids in our “craft room” where we paint, draw, and cut and assemble collages. I think “Constructed Angel” was directly influenced by Riley Fessenden, a girl from Beverly who passed away last month after her battle with cancer. I had read that she “flew away with her angel wings” and somehow that rested in my subconscious and manifested while I was with my kids. I also read somewhere that children who pass away are the first ones to become angels, and I really do believe this was the case with Riley. I didn’t know her, but I feel her playful, audacious spirit. Laurette Folk ‘s fiction, essays, and poems have been published in upstreet, Literary Mama, Boston Globe Magazine, Talking Writing, Narrative Northeast, among others. Her novel, A Portal to Vibrancy, was published by Big Table. Ms. Folk is a graduate of the Vermont College MFA in Writing program and editor of The Compassion Anthology. My love for Italy is unbreakable. To be able to stand in a place that has been in existence for centuries, in a place where people come from all over the world to stand in silence and in awe of the beauty, is indescribable to me. Architecture and sculptures draw you in. They make you feel hope, joy, pain and sorrow. I believe one of the greatest gifts in life is the ability to feel emotion. Vicki Caira is a travel photographer from Beverly MA. Architecture and statues are her favorite subjects. Her website is www.vpvphotography.com. When women are at a “crossroads” in their lives it can be a time of crisis, confusion, pain and vulnerability. The direction that we decide to take at the crossroads may be very clear, or it maybe very uncertain. When a decision has been made it can give us either a sense of control in our lives or it can create a feeling of ambivalence. Nevertheless, when we encounter these “crossroads” it is how we deal with our decision that can help make us stronger or weaker. Women face personal, professional, ethical and practical decisions every day throughout the world. Our sense of humanity, empathy, and charity to other women, who are barely surviving around the globe, are the key to the future of this planet. Michele J. Kenna, a transplanted Canadian, has lived in Beverly, Massachusetts for over 30 years. She has a Bachelors of Fine Arts degree from the University of Toronto and has exhibited her work in numerous galleries in the Boston area and the North Shore. Michele has studied with nationally and internationally known artists such as Wolf Kahn who taught and mentored her in the pastel medium. She continues to develop her unique style of landscape and abstract painting at Porter Mill Studios where she is a resident artist. What I know about my work is how powerfully it is influenced by the world around me. My technique varies between rapid movements and slower, methodical, deliberate strokes. There is always a push and pull that goes on during the creative process, one that builds depth and tension. I sometimes combine lyrical and gestural markings with broad brushstrokes. My paintings are not planned, but rather spontaneous acts of expression. Someone once said to me “paint like it’s your last time.” That statement has always stayed with me and has helped me grow as an artist. When I approach my work with the understanding that it could be the last painting I’ll ever do, I let go. And in the process of letting go, I find my voice as a painter. My work is very much an extension of myself and comes form the deepest part of my being. I use color, form, line, and movement to express my vision. There is an energy to my work; it can be subtle or more pronounced, but my intention has always been to create with emotion and produce work that is both compelling and interesting to the eye. Abstract expressionism has taught me that creativity goes way beyond what we see and is very much about what we feel and think. Isabelle Peabody was born and raised on the North Shore of Massachusetts. She attended Endicott College for art therapy, and it was there that she discovered abstract expressionism and began her own journey as a painter. Her work has been exhibited in local galleries such as Time & Tide Fine Art in Ipswich, MA; Local Colors in Gloucester, MA; The Art Exchange in Beverly, MA and the Carol Grillo Art Gallery in Beverly. She was a featured artist in the Manchester Arts Festival in 2009. She has also spent some time in New York City where she attended the Arts Student League and participated in on going exhibits as well as displayed her work on the Upper East Side. You can view more of her work at www.izpaintings.com. As a woman, I am wholly aware that for 650,000 years what we wear has and will always define who we are. Our clothing, without doubt, is a reflection of our mind, body, and soul. In our fast-paced world of mass production, I strive to create one-of-a-kind and limited collections of women’s apparel. As each garment is imagined, designed and created by hand, an over-all intimacy is absolutely ensured. It is my intention that each garment will allow a woman to express herself … without ever saying a word. Vivienne Lowe is a graduate of Lasell College with a Bachelor of Arts degree in Fashion Design and Production and a recipient of the Christie Proctor Award. She has been in several group exhibitions and has held several solo events showcasing her work. Vivienne maintains a belief that personal empowerment is found through self-expression and what we wear is part of that. As co-founder of TIEN 2, she continues to create women’s apparel in silk, cotton, wool and linen, with each piece designed and constructed by her, on site, for you. Every garment is cut and sewn individually, one piece at a time. Fabrics are hand selected for their natural fiber, drape and gorgeous weight, luscious color and wonderful texture. It is not out of the ordinary for Vivienne to design a piece of jewelry to complete her vision. Over the past 6 months, I have grown into my self as an artist. Art has also been an amazing way for my daughter and I to bond and find quite time together. Sometimes we work on a project together, sometimes we alternate between pieces, and sometimes we find comfort working on our works in shared space. We have found art to be an amazing experience between a 3 year old and a mother. Parenting is not always easy, and sometimes as a working mom I need a lot of patience, not only with Jax, who is figuring out the world, but also with myself, as I wear multiple hats. We both have long days. Art is a place for us to find compassion for one another while sharing a mutual passion. The encouragement is mutual and the experience helps us to grow together. Tarin McAdoo Comer started her college career in art school and ended up a web developer. She introduced her daughter Jax to fingerpaints once she could sit up. Tarin most recently returned to art after twenty three years with the help of her daughter and a friend. When I heard about the Women Artists and Writers exhibit coming to Porter Mill, I wanted to be a part of it. I have struggled for much of my adult life, balancing my time with work, running a household, raising a child, and finding time to create. When I was younger, I limited my creative choices and tried to make what I could from the limitations. I have more recently tried to continue on with both courage and compassion. My pieces utilize my background in graphics, and I enjoy making spatial relationships work. Recently I have been interested in public art and combining various mediums to draw attention to both a sentimental past and taking better care in the future as we hopefully heal our planet. Our world needs women (and people) with compassion and courage more than ever! If I can make a small difference by having a viewer find joy in small things, and consider consequences of their actions, I believe I have succeeded on some level. My hope is to expand this theme as I continue to “make” moving forward.